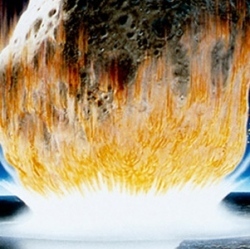 About 65 million years ago, the Earth was struck by an asteroid some 10 km in diameter with a mass of well over a trillion tons. We now know the immediate impact of this event—megatsunamis, global wildfires ignited by giant clouds of superheated ash, and, of course, the mass extinction of land-based life on Earth. Today, we get an answer from Tetsuya Hara and buddies at Kyoto Sangyo University in Japan. These guys say a surprisingly large amount of Earth could have ended up not just on the Moon and Mars, as might be expected, but much further afield. In particular, they calculate how much would have ended up in other places that seem compatible for life: the Jovian moon Europa, the Saturnian moon Enceladus, and Earth-like exoplanets orbiting other stars. Their results contain a number of surprises. First, they calculate that almost as much ejecta would have ended up on Europa as on the Moon: around 10^8 individual Earth rocks in some scenarios. That’s because the huge gravitational field around Jupiter acts as a sink for rocks, which then get swept up by the Jovian moons as they orbit. But perhaps most surprising is the amount that makes its way across interstellar space. Last year, we looked at calculations suggesting that more Earth ejecta must end up in interstellar space than all the other planets combined. Hara and co go further and estimate how much ought to have made its way to Gliese 581, a red dwarf some 20 light years from here that is thought to have a super-Earth orbiting at the edge of the habitable zone. They say about a thousand Earth-rocks from this event would have made the trip, taking about a million years to reach their destination. Of course, nobody knows if microbes can survive that kind of journey or even the shorter trips to Europa and Enceladus. But Hara and buddies say that if microbes can survive that kind of journey, they ought to flourish on a super-Earth in the habitable zone. That raises another interesting question: how quickly could life-bearing ejecta from Earth (or anywhere else) seed the entire galaxy? Hara and co calculate that it would take some 10^12 years for ejecta to spread through a volume of space the size of the Milky Way. But since our galaxy is only 10^10 years old, a single ejection event could not have done the trick. However, they say that if life evolved at 25 different sites in the galaxy 10^10 years ago, then the combined ejecta from these places would now fill the Milky Way. There’s an interesting corollary to this. If this scenario has indeed taken place, Hara and co say: "then the probability is almost one that our solar system is visited by the microorganisms that originated in extra solar system."